Origami Without Fingers | Origami with regular paper can produce a limitless number of fascinating, beautiful and useful shapes, but we lack “fingers” at the nanoscale to guide the folding. Researchers in the Two-Dimensional Crystal Consortium at Penn State have conceived and simulated a novel way to “program” a folding pattern by patterning the nanoscale sheet with complementary regions of n-type and p-type doping. Such regions prefer to adhere to each other more than they like to adhere to themselves, and the boundaries between these regions define the fold lines of the final origami structure. Forcing the sheet through a small hole is enough to start the folding process, and controlling the shape and depth of such holes provides another means to influence the order in which the folds occur. A new way to control the precise folding geometry of 2D sheets has been conceived and validated by a combination of first principles and empirical modeling. 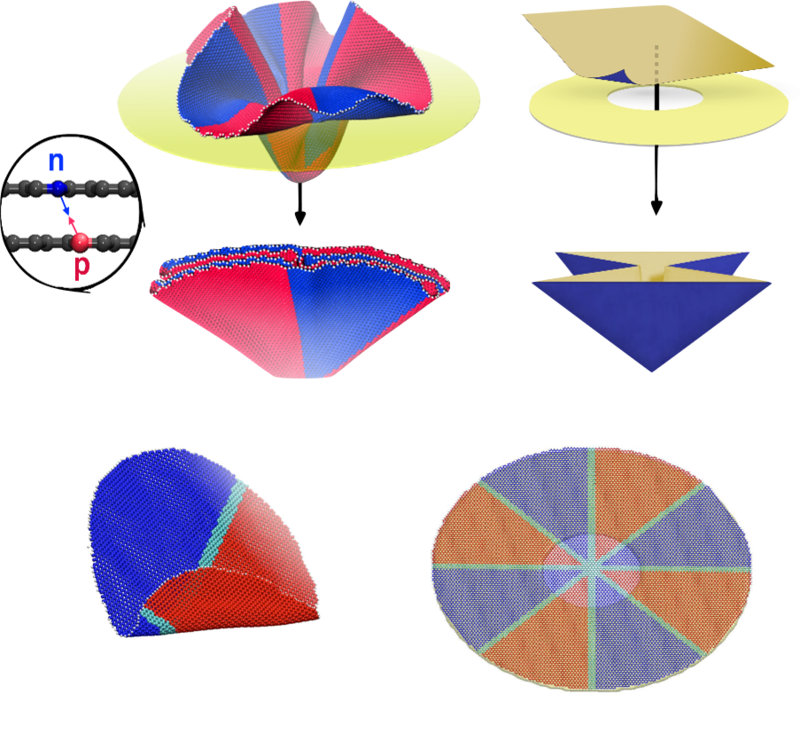 It is challenging to precisely control fold geometry at the nanoscale. Such folds enable the production of new 3D structures from 2D sheets, with potential for new functionalities. This work shows how a very straightforward and familiar process – doping – can control the geometry of folds. Close collaborative interactions across different disciplines of theory and simulation. Y. Wang and V. H. Crespi, “NanoVelcro: Theory of Guided Folding in Atomically Thin Sheets with Regions of Complementary Doping”, Nano Letters, 10.1021/acs.nanolett.7b02773.